list features some of the many issues and events we worked on or were involved with. Casey Cruishchank and Megan Bunday carry the NEC banner in the All Species Parade. Photo: Adam Taylor. • The NEC closely scrutinized the Humboldt Communities Services District’s desire to annex the Indianola area, potentially bringing city water there and to the Redmond Road area. Fortunately, this was not approved. If it had been, it would have resulted in many subdivisions and “McMansions” in this currently forested area between Eureka and Arcata. • Educated the community on the revival of the environmentally destructive east-west railroad concept and the concept’s supporters. • Organized a Board of Supervisors Candidate Questionnaire to ensure our community was informed regarding the positions of the candidates on important environmental issues affecting Humboldt County. Also participated in community forums with the Humboldt supervisorial candidates, and Eureka mayoral and City Council candidates. • Supported Supervisor Mike Wilson’s resolution that gives direction to incorporate anti-offshore oil policy into Humboldt County’s Local Coastal Plan (LCP) update. The resolution was passed unanimously by the Board of Supervisors and is the strongest local way to protect our coast from offshore oil drilling. • In collaboration with Humboldt Baykeeper and EPIC, called for and received the resignation of Humboldt County Planning Commissioner Kevin McKenny. Mr. McKenny had been served with a Notice of Violation and a Cleanup and Abatement Order by the North Coast Regional Water Quality Control Board (NCRWQCB), placing him on notice that he violated numerous federal and state laws, which is unacceptable for a Planning Commissioner. • Brought back the popular EcoNews Report Roundup, a monthly overview of current news stories hosted by Larry Glass and Bella Waters. • Thanks to amazing supporters, we launched a new website that’s easier to use, update, and is viewable on various mobile devices. • Through the work of our Program Coordinators Anne Maher and Casey Cruikshank, the NEC’s Adopt-a-Block program has grown to 28 volunteers! They gathered 18,034 cigarette butts and 2,107 pounds of debris from our streets, storefronts and trails. 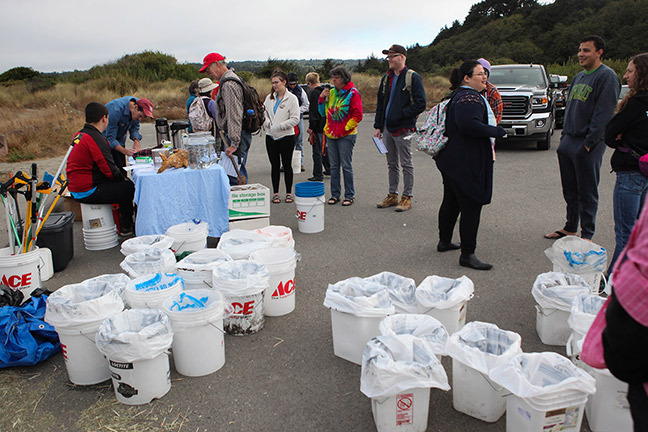 • Our Coastal Program Coordinator Madison Peters organized another vital and successful Coastal Cleanup Day, removing over seven tons of trash from our waterways and bringing together over 800 volunteers. • Organized the successful All Species Parade in collaboration with Arcata Playhouse, Jessy Jonathan, and Bandemonium. • In the spring, we partnered with Redwood Region Audubon Society to co-sponsor the Fourth Annual Tim McKay Memorial Birdathon, which was a flocking success. • SB 835—State Parks Smoking Ban, and SB 836, both of which were vetoed by the Governor but are now before the Senate. These bills would ban smoking in state parks and on state beaches, greatly reducing the amount of litter that’s affecting wildlife and water courses and will also address public health concerns associated with smoking. In addition to the fines imposed by both bills, the NEC encouraged adequate funding of personnel to be able to enforce these regulations. • SB 1335—Sustainable Take-Out Food Packaging for State Parks, Beaches, and Facilities. Approved by the Governor, SB 1335 ensures that food packaging is made of sustainable materials and the used packaging is captured for recycling and composting at a rate of 75 percent or higher at our state parks and beaches. • AB 2369—Preventing Poaching in Marine Protected Areas. Approved by the Governor, AB 2369 will create more stringent penalties for commercial and party boat poaching in marine protected areas (MPAs), and prohibit a fishing license or permit from being transferred when enforcement action is being taken or there is an ongoing investigation into poaching activity by the license or permit holder. • Weighed in on the Notice of Preparation of a Draft Environmental Impact Report (DEIR) for Titlow Hill area illegal subdivisions controversy with the County. • Continued to engage with Humboldt County over its cannabis ordinances to ensure reasonable enforcement efforts are included with the permitted expansions. • Educated the community on the Planning Commission’s decision for a zoning change for another toxic chemical cannabis extraction facility at Big Rock in Willow Creek, near the popular swimming hole and a few feet from the 100 year flood zone. • Continued to work with Shasta-Trinity and Six Rivers National Forests towards better forest management and fuels reduction. • Submitted comments in response to the Trinidad Rancheria Hotel Project’s Environmental Assessment. • Provided comments in response to Endangered and Threatened Wildlife and Plants: Listing Species and Designating Critical Habitat; and Endangered and Threatened Species: Revision of Regulations for Prohibitions to Threatened Wildlife and Plants; and opposed the de-listing of the Gray Wolf (Canis lupus). • Continued to participate with Congressman Jared Huffman’s staff in preparation for the introduction of his Northern California Conservation and Recreation Act (HR 6596) in the House of Representatives in coordination with Senator Kamala Harris’s introduction of the Act in the Senate. • Continued to support and advocate for the Northern California Great Redwood Trail and the dismantling of the North Coast Railroad Authority. All of these accomplishments and projects wouldn’t be possible without your support, so thank you! Please consider donating, renewing or gifting NEC membership in the coming year to help us continue our important work.